Finally meeting in person someone you’ve followed from afar always changes how you look at them. Consider celebrities. If they take a few moments to talk to you, if they’re welcoming, if they somehow live up to the image you’ve built in your head? It’s a thrill. If they are brusque, rude, not all they’re cracked up to be? It’s a disappointment. With horses, it’s a little different. It is hard not to love a horse more after meeting them, no matter what. If the horse is biting or distracted…you can’t blame them in the same way you can hold it against a person. If that happens, you can chalk that up to their idiosyncrasies, and still enjoy the fact that you are lucky enough to have been up close to a runner you like. However, if they are a complete sweetheart, or if they are even more beautiful up close? That can be magic. I have long been a fan of Buzzy. He is a big, grey son of Fort Prado, something that made me start following him in the first place. He also won a race back in February, a race I will never forget due to how much it made me think of another tank I loved. Saturday morning, I met Buzzy. Don’t let this picture fool you. Buzzy seems even bigger up close than he looks in the paddock. Being up close to a horse I had admired so many times in the paddock made me so happy. Up close, his height made even more of an impression, and it hit me just how much he had greyed out since he was three. Particularly in his face, he was lightening. But, his personality was the thing that really made meeting Buzzy one of my favourite horse racing moments to date. He was such a people horse. He didn’t know me from anyone else, and I had not even bribed him with a peppermint. Yet, he let me keep petting him, and kept snuggling his head against my shoulder and my chest. Though I only got a few minutes to hang out by Buzzy’s stall, it was enough to make him even more of a personal favourite. 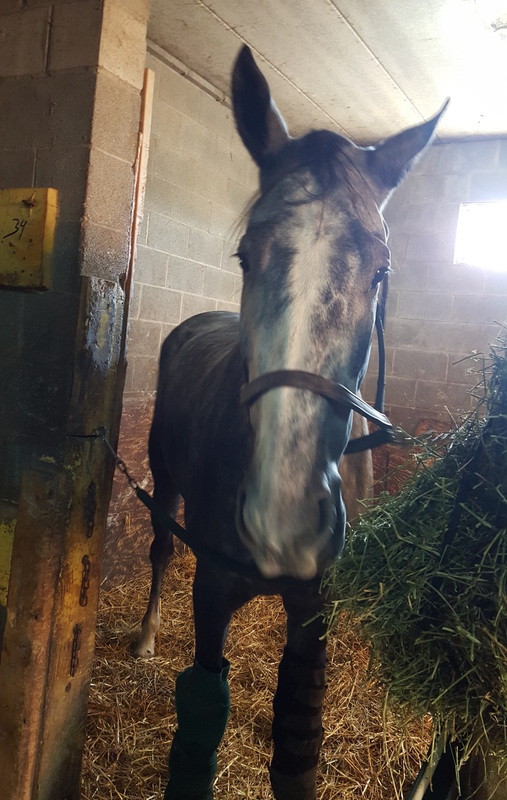 I’ve met so few racehorses who are full-on snugglebugs, and to find out that one I loved for so many other reasons was such a sweet horse, and responded so well to me? Meeting Buzzy was even better than I could have imagined it would be.